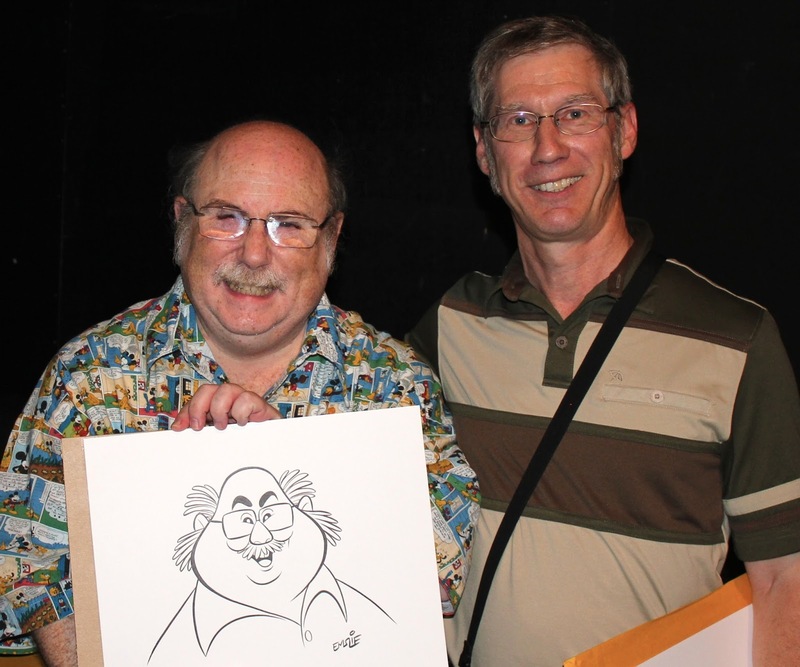 The Cartoon Cave: Happy Birthday, Eric Goldberg! I see that today, May 1st, is the birthday of that master Disney animator, Eric Goldberg. Here's a photo of myself and Eric when he came to do a presentation at Sheridan College back in September 2013. Eric is a delightful, jolly little fellow, and his sprightly animation for Disney famously includes the Genie from Aladdin, which Eric caricatured to resemble his voice actor, the great Robin Williams. I have written about that in this previous blog post. Other characters that Eric has skillfully brought to life in Disney films include Phil, the grouchy little satyr who reluctantly agrees to act as personal trainer to Hercules (who looks uncannily like his voice actor too - Danny Devito!) He also animated Louis, the alligator and aspiring Dixieland jazz trumpeter from The Princess And The Frog. More recently, Eric revived Donald Duck, José Carioca the parrot, and Panchito the rooster, known collectively as The Three Caballeros, for the renovated boat ride in the Mexican pavilion at EPCOT's World Showcase. Which was a fitting assignment, given that the original film characters were masterminded by the legendary animator, Ward Kimball, and Eric is very much this generation's equivalent of Ward, with the accent on highly cartooned design and rapid fire movement in much of his output. 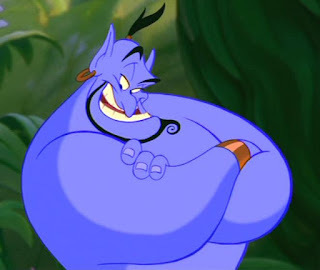 But my favourite animation by Eric Goldberg is the brilliant Rhapsody In Blue segment from Disney's Fantasia 2000, which he directed with so much passion (with wife, Susan Goldberg art directing), as he got to base the overall look on the style of one of his artistic heroes, New York's legendary Broadway caricaturist, Al Hirschfeld. I too share Eric's admiration for Hirschfeld, as he has been the biggest influence on my own approach to drawing caricatures. I know that Eric was just up this way again only a week ago, giving a lecture and workshop at the Toronto TAAFI animation festival. I regret not being there to see him myself, but I've heard back from several of my former Sheridan College students who were thrilled to hear his lecture and learn animation tips from him. I'm sure it would have been a most enjoyable event. Happy Birthday to you, Eric Goldberg!